Asparagus are grown in beds which stay down for many years. Asparagus are usually grown from crowns. A crown is the root system of a one-year-old asparagus plant that is grown from seed. Buy healthy, disease-free crowns from a reputable crown grower. permanent, as Asparagus plants live for about 15 years; so the site needs to be where it is not in the way. Plant the crowns, 30 cm apart, in the trench, on top of the mound, and fan the roots out either side. The pointed part of the asparagus root should be facing upward. back fill the trench to the original soil level. Pat the soil down to get rid of the air pockets but do not compact the soil too much. Water the newly planted bed. 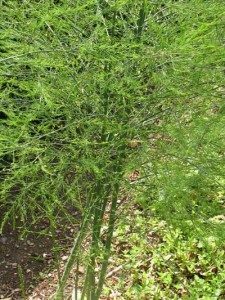 Do not harvest the asparagus spears in the first year after planting and allow asparagus fern to develop. Cut these down to 5cm above the ground in autumn. In the second year harvest the asparagus spears when they are 12cm long above ground. 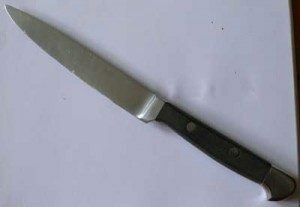 Use a sharp knife, and cut the stem 7cms beneath the soil. Asparagus are easy to cook and have great nutritional value. White asparagus are grown in a different way, so that the light is excluded.